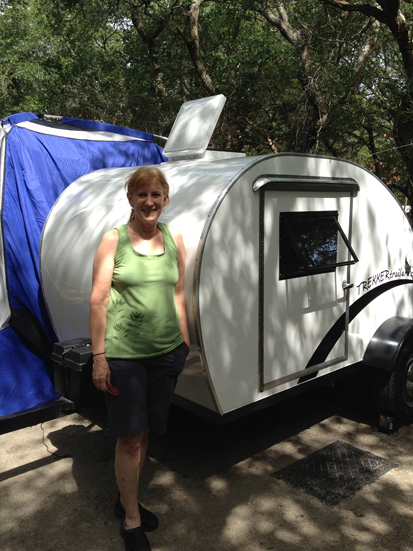 You can’t live much tinier than a teardrop trailer. 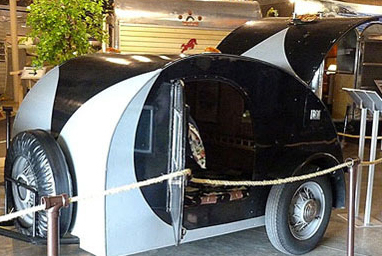 A product of the Great Depression, these curvy, streamlined campers provide all you need for cozy living. They’re small enough to store in a garage, can be pulled by most cars and keep your camping gear ready to go at a moment’s notice. We’ve established that I like tiny things. I also love retro things. The first time I saw a teardrop, I swooned. I was at a yard sale with friends, and it was all I could do to resist the urge to hitch it to the back of their van and drive into the sunset. When my husband and I started to simplify our lives and increase our time outdoors, the image of that first teardrop came rolling back. We’ve always loved camping, but sleeping in tents has lost some of its charm over the years. We both covet small campers like a VW Eurovan or a Roadtrek, but that doesn’t fit our lifestyle quite yet, for several reasons. • They don’t come cheap. to use one enough to justify the cost. • They have engines, and that means complications. drive our daughter’s carpool two hours round trip twice a week. So a teardrop is the perfect get-away option for us right now. Our trips are short, usually no more than a weekend. We aren’t traveling through big cities where parking is an issue and the back roads of Florida are trailer-friendly. In fact, you stand out if you’re not towing something. For you builders out there, making your own teardrop is a great option. In fact, the early models were homemade. The first-known specs appeared in the 1936 issue of Outdoor Life magazine, according to the New York Times. As out-of-work Americans migrated in search of jobs during the Depression, a free bed on the road was better than sliced bread. Built of plywood and maybe a discarded car frame, teardrops made a tough life more bearable. In 1945, Kit Kamper, based in California, produced early factory-made teardrops. But post-war prosperity brought bigger cars, which bred bigger trailers. The humble teardrop dropped out of sight. In recent years, these tiny trailers have made a big comeback. They have their own on-line forums, websites, books and a new magazine, Cool Tears. You can find dozens of plans on e-Bay, new models from builders all over the country and used tears on-line. Some original Kit Kampers are even still around. When we set out to find our teardrop, we considered age, materials and size. We found a perfect mix at Trekker Trailers in Eustis, Florida, less than two hours from our house. Built by Andrew Bennett, who has both an art and engineering background, our teardrop is a classic. Half moon wheels and vintage chrome handles accent a white aluminum skin and birch plywood interior. It is also a demo model, with lots of extras, so Andrew gave us a great deal. It arrived in perfect condition, and a monsoon at Anastasia State Park the next week proved it to be snug and watertight. At five feet wide, it holds a queen mattress, but it’s short enough to fit in our tiny garage, even with the added Fantastic Fan roof vent. We’ve named her Lizzie, in a tribute to the Model T Ford “Tin Lizzie” that brought the first wave of Florida tourism, the “Tin Can Tourists.” We’ll be heading out soon to the Tear Jerkers’ Kick Off the Year Gathering near Palatka, Florida. All our camping and cooking gear is stored in the teardrop, so all we have to do is hitch up Lizzie and go. Toot your horn if you see us bouncing down the road.